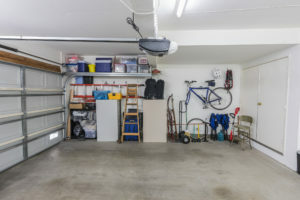 Go through everything in your garage and get rid of all the debris, mulch, leaves and dead insects that gets tracked into the garage during the summer months. get under all of the nooks and crannies, so don’t be afraid to move things around, like your car and sets of shelves. Install vents in your garage walls so that evaporated water has an escape route. Without ventilation, water vapor can end up re-condensing back into the water, or ice during the colder winter months. Lubricate all metal moving parts with a silicon-based material while avoiding the plastic pieces. The lubricant often comes conveniently as a spray, so you can cover specific areas with a cloth to keep it grease-free. Remove ice or other debris to prevent buildup of a block. When the path along the track is free from ice, open and close the garage door to keep the moving parts in alignment. Take a few minutes this season to winter-proof your garage by covering any outlets on an outside wall. This will help to keep some of the brisk air out.